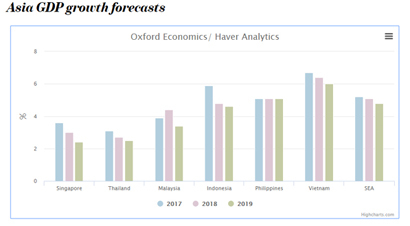 Economic growth across the South-East Asia (SEA) region is expected to cool in H2 2018 into 2019 according to ICAEW’s latest Economic Insight: South-East Asia report. Among SEA economies, Vietnam is expected to continue to outperform the region with the economy forecast to grow by 6.7% in 2018 and 6.3% in 2019. Meanwhile, Singapore is expected to see a more discernible slowdown, reflecting its heavy dependence on exports (around 174% of GDP). Growth in the region is expected to ease to 5.1% this year from 5.2% in 2017, with growth moderating further in 2019 to 4.8% as moderating Chinese import demand and escalating US-China trade tensions dampen exports and business investment. Economic growth edged lower in Q2 across most of the South-East Asia economies, with average GDP growth for the region easing to 5.2% year-on-year, down from 5.4% in Q1. In addition, while recent regional trade data suggests some resilience in external demand, forward indicators point to softer export momentum in the coming months, with the aggregate measure of South-East Asia PMIs moderated to 50.9 in July, from 51.1 in June. New tariffs set by both the US and China indicate an escalation in US-China trade tensions, which is forecast to worsen with a 25% and 10% tariff implemented on a cumulative $150 billion of imports from China, and China retaliating in kind. While the US will remain focused on trade with China, higher US tariffs on Chinese imports will indirectly impact the region. An escalation in the US-China trade tensions, a slide in CNY, and more recently the Turkish lira crisis has led to most emerging market (EM) currencies weakening against the US$ this year. However, solid macroeconomic fundamentals have helped Asian currencies to remain robust and weakened moderately. Looking ahead, EM currencies will likely see more volatility to come given the expectation of further near-term strength in the US dollar, rising US interest rates and the eventual tightening of monetary conditions globally. Oil price movements, the evolving US trade policies, as well as the unfolding of major geopolitical events (such as Iran sanctions, political uncertainty in Europe, etc) will only add to this volatility. Conversely, most Asian currencies are likely to remain relatively robust compared with other EM currencies. There are unlikely to be any major moves in Asian currencies, and economies with strong fundamentals are expected to see their currencies appreciate modestly against the US dollar by end-2018.